Ryan Clarke says he is relishing the fight he faces with Adam Smith to become the Cobblers’ starting goalkeeper this season. The 33-year-old signed on at Sixfields on Thursday following his release from Oxford United, a week after Smith joined from Leicester City. 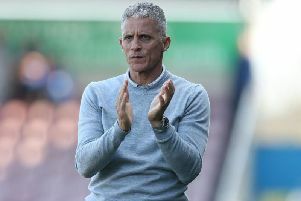 Cobblers boss Chris Wilder says he has made it clear to both players that neither is coming to the club as number one, and that he wants them to earn their place in the team, week after week. That is a situation that suits Clarke, despite the fact Oxford manager Michael Appleton stated that he felt the player didn’t fancy the competition to be the main goalkeeper at the Kassam Stadium. But Clarke has made it clear he is very happy to fight for his place at Sixfields, indeed he intends on thriving on the competition. “Adam Smith is a good young keeper, coming from a Premier League club,” said Clarke. “I have spoken to couple of goalkeeping coaches about him, and they rate him highly, so it is going to be a good challenge for both of us in pre-season. “Hopefully we can bounce off each other through our career here, and we can push each other all the way. “I know if he is playing I will be backing him, and if I am playing I am sure it will be the same the other way round. “I have no divine right to come here and play, it is all about making sure I prove myself, first and foremost to myself, then to the management, the fans and the players around me as well. Clarke spent six years at Oxford, and is now looking forward to a fresh start at the Cobblers, a club he has always admired from the outside. “This has always been one of those clubs, that if you come here and win then it is a good scalp,” said Clarke. “It is always a tough place to come, it is a well-supported club, and it feels like they are one of those teams that should be at the top of the league. “I think that showed last season with the way Northampton turned things around. “Northampton is an attractive club to come to, and especially so with the playing squad they have here now.